Click on following links Official Rules of USA Ultimate, 11th Edition, Ultimate Players Association. 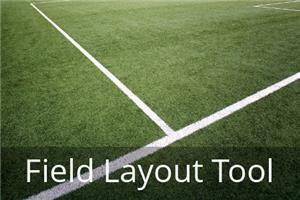 Download our fast and accurate Ultimate Frisbee Field Layout Tool to help strip your fields. This simple MS Excel spreadsheet takes the guess work out of creating a uniform Ultimate Frisbee field no matter the size requirements. The TruMark Ultimate Field Layout Tool is designed for Ultimate organizations and field striping personnel needing a simple yet accurate tool to help in laying out and striping their sports fields. 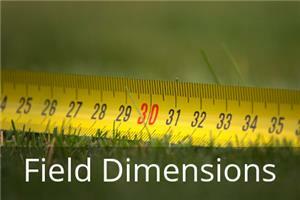 No matter what your requirements you can generate symmetric dimensions for any age group or space restrictions. The desktop tool uses the MS Excel spreadsheet application with functions that generate staking locations based on user supplied dimensions and the center line of the field through the center point, the goal, end zone, player and spectator lines. The spreadsheet layout tool allows the user to plug in a value (in feet) into a cell below each listed Ultimate field dimension. 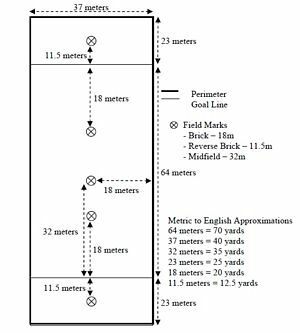 The orientation of the layout tool is based on staking out the full length of field down the center line of the field intersecting the goal line through the endzone line, player, and spectator line. The actual field staking procedure requires the use of two measuring tapes. One tape is staked or held at the Midfield (center point at the middle of the field and pulled to the associated intersection points. The other tape is staked or held at the Center Point on the Spectator Line (beyond the end zone and player line). The layout tool calculates the intersections for the two tape measurements listed in feet and inches or just feet. The Ultimate Layout Tool reflects the stake intersections for 1/4 of the Ultimate field (upper left quadrant when looking at a field with goals left to right). Tru Mark has tested the field layout tool on a BlackBerry Curve 8900 series smartphone with good results. Now if you need to make changes out on the field of play you can input the updated dimensions and the smartphone spreadsheet application will automatically update the measurements for the staking positions. Read more what about the application used and the process to install the field layout tool template . 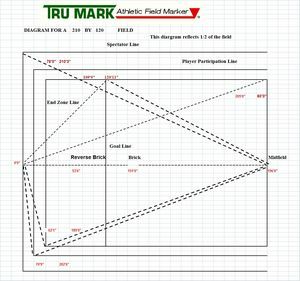 Tru Mark Athletic Field Marker Soccer, Lacrosse, Rugby, and Ultimate Field Layout Tools. We have not tested any of these downloads since I currently don’t have access to an Apple device. We would appreciate any feedback as I need to update the link as I don’t see the app on the site currently listed. Learn about field painting and turf tips, sports turf industry trends and future trends impacting our local community.Here is some information on field marking operations. Click here to learn How to Select a Field Marker . The article lists a series of questions and notes concerning the capabilities and features you should consider when making a purchasing decision. Click here for the advantages of using acrylic latex field marking paint for striping your sports fields. Click here to understand the cost savings advantage of using acrylic latex paint over aerosol paint. Marking whiskers paired with raptor stakes or penny nails can be used to mark the intersections on your field. Use these whiskers with integrated stakes to mark the intersections on your field. Use this tool to lay out the lines on your field. Your cordless drill will wind the string back up in minutes! © 2019 TruMark Athletics. All Rights Reserved. Website by Efinitytech.